Displaying a selection of powerful and poetic work, ‘The World Beyond’ will explore the relationship between the paintings and sculpture of Breon O’Casey, whose unique style is characterised by simple forms and lines, uctuating between guration and abstraction. Exhibition highlights will include previously unseen paintings and early sculpture, as well as a selection of hand-crafted jewellery. Breon O’Casey, a versatile artist and craftsman, made his mark as a fully- edged St Ives artist in the late fties. He began his career working as an assistant to sculptors Denis Mitchell and Dame Barbara Hepworth, before becoming a prominent member of the St Ives school. Highly productive throughout his career, he successfully mastered a wide variety of materials and making processes including weaving, painting, printing, jewellery-making, and later, sculpture. He grew up in a home lled with colourful works by Europe’s modern masters, where his father, the great Irish playwright Sean O’Casey, dreamed of being a painter himself. Infused with his father’s passion for art, it is not surprising that Breon was inspired to paint. ‘It was like sharing a house with Matisse,’ he recalled. Using geometric shapes and a colourful palette, he had a tendency to work in three contrasted shapes placed in a parallel row, rather like still life objects. ‘(...) two is a pair, but three is magic – it’s the shorthand for in nity. It’s a row. It’s the shortest row you can have, but somehow means continuity’. These repetitive patterns and shapes may also be reminiscent of the in uence of Celtic culture in his upbringing - predominantly apparent in his abstract landscapes. Breon O’Casey’s work also explores familiar themes such as birds, foliage, boats and other animals. 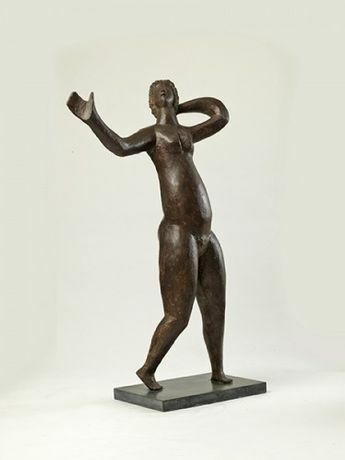 The human gure is another preoccupation to which he frequently returns, and many of his works echo his fascination for ancient and non-western art – particularly in the primitive style of his sculpted gures, such as ‘Acrobat’ (illustrated on the next page). In both his paintings and sculpture, Breon O’Casey’s care and patience for the materials stand out, alongside an elegant simplicity & lack of showiness. ‘The World Beyond’ will display beautiful vibrant works of an organic, unfussy quality – emphasising a parallel in his vision across painting and sculpture.